Last autumn I ran a brooch making workshop for Kym which is where I met Yoshiko and Kazuho. They are both crafty ladies, check out their blog/shop, it is all Japanese but you can look at the pictures, if you like the Japanese style you will love their work! Anyway, I invited them for a playdate at the local park, Yoshiko invited a few friends so it ended up with about 18 kids! Most of the boys were off catching bugs the rest of the kids were paddling. 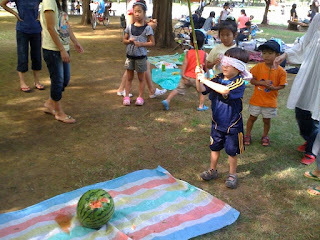 After lunch, the kids were rounded up and a watermelon, blindfold and large stick produced. This is a traditional summer 'game', starting with the youngest, the kids were blindfolded one at a time, spun round then told to hit the watermelon, one strike only. Quite amusing but I was surprised no-one lost an eye considering the amount of kids trying to get in on the action :o) Ebi-kun has never done this before and I don't think he had any idea what was going on, he did really enjoy it. Once the watermelon is smashed into eatable chunks, everyone digs in. If you would like one, they are $11 including shipping. Just send me an email to jojoebi.designs (at) gmail (dot) com telling me which kit you would like and your Paypal email address and mailing address. and while I am at it, Serenity The Mermaid PDF patterns are still available, it is $6. 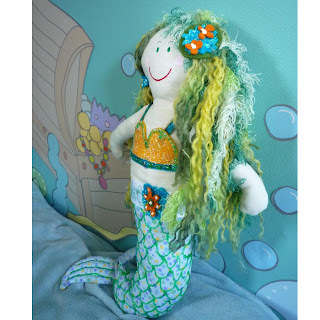 This pattern for a beautiful mermaid comes with a full set on instructions and an ideas and inspiration page. All the pages can be printed onto A4 paper, no need to be enlarging pieces (unless you choose to make a bigger doll). The pattern is easy to follow, suitable for an advanced beginner. 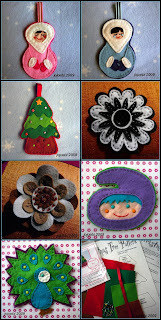 It would be a great project to do with a young girl, you sew, she designs the accessories! Or make a perfect gifts for all those little girls birthdays and Christmas presents. The finished doll stands approx. 35cm /14" high. The pattern also includes a cute little fishy tail tote bag for the mermaid to be carried in when she is not hanging out by the sea.